Steve's Personal Blog: How do you use a bag? How do you use a bag? I picked up a courier-style bag from a friend, and it had a weird clip on it. I wrote to MEC to figure out how to use it. They have very courteous and friendly customer service. I recently picked up the Brenta Courier Bag (used) from a friend of mine. I like the bag, but I think I need an instruction manual for this crazy buckle on the side. I would like to take full advantage of all this bag has to offer, but I am no courier and I can't figure out how it works. Is there any kind of literature for this bag? Like a PDF that I can download or something? Anything would help. I have a Brenta bag and a few others that use that crazy buckle. I think by that you mean the large one that adjusts the length of the main carry strap. I don't have a PDF or other documentation on it but don't find it that hard to use. Usually you simply lift the large plastic tab (sort of like very old school car or airplane seat buckles) and simply slide the strap up or down to make the overall length adjustment. 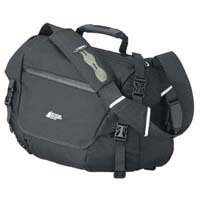 This creates a loop below the buckle (especially when the strap length is fairly short), but is very secure for carrying heavy loads and produces not long trailing end of excess strap that can get caught in things. There is also of course the cross body strap that needs adjustment. Essentially the smaller strap just triangulates the other strap keeping the bag stable, but can be undone easily so that the bag can be slung down to the side or front of your body to access the contents or just to wear at your side, not on your back. This strap should meet the other strap at your sternum, roughly. The defacto standard in Courier bags is the Timbuk2 brand, and I have found a link on their site that shows how to wear their bags which are very similar to ours and use the same buckle type. Arrrr...It be talk like a pirate day!